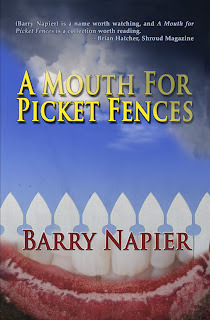 Barry Napier, A Mouth for Picket Fences. Needfire Poetry, 2010. Pp. 88. ISBN 9781926912066. $9.99 print / $2.99 e-book. How do you review poetry? It’s such a subjective art, both in the writing and the reading. This wasn’t always true. Poetry was the primary form of stylised speaking and writing, as a performance art in the past; now, apart from its role in song, it’s a minority art mostly accused of being elitist. As a writer and appreciator of poetry I focus on emotion and passion and on these ways of experiencing and thinking about life, relationships and self. I like poetry with a strong emotional core. To me the power of poetry is its ability to point to the deep complexity of life beyond the limitations of words, its medium. For me another important quality of good poetry is the sense that it expands our language by playing with its metaphoric uses and the edge-meanings of it. Barry Napier’s book is full of beautiful poetry in a modern free-verse form which fulfils these criteria admirably. Some of the poetry in the book continues the pattern of elitism of modern poetry in the complexity of its colliding imagery in ways that obscure meaning and feeling at first but then you learn his language. There is a sense of melancholy to his style which is not quite the enraged darkness we see in a lot of modern poetry, that slows you down to think and feel. He disrupts the blackest moods he suggests with gentle humour. A humorous way of expressing the limitations of time yet filled with compassion. The poem is lovely and profound about the way symbol and organisation can overtake life by talking about how thin the calendar page is between September and November. The sad thought that a month is reduced to no more than a page in that calendar. The book is divided in three segments or chapters: ‘Normalcy’, ‘The Darkness Weighs Us’ and ‘(in)humanity’. To be honest I found it hard to know the relevance of the titles of the segments to the poetry within them. Normalcy has pieces, like the above three, which don’t necessarily seem to have much to say about normal life, unless he is saying normal life is melancholic. 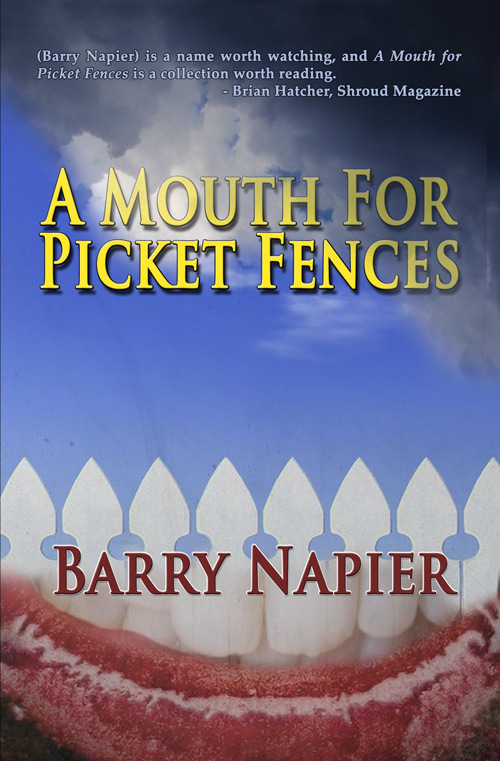 The first poem of the second segment gives the book its name, ‘A Mouth for Picket Fences’, a description of mysterious evil, or is it God? This poem suggests a Stephen King-like story and character with an Old Testament complexity for the higher power. The strength of this poem is that he could be talking about marketing and capitalism just as easily as gods, demons and/or spirits. This poem has quite a different feel to the poetry of the first segment, there is a passion and clarity of opinion to it. The next poem ‘Morning Choir Practice’, a reflection on the sounds of a suburban morning chorus, returns to the melancholic feel of the first segment, but has a more judgemental sense to it. In away it seems to be more of a statement about normal life than most of the poems in the segment called ‘Normalcy’. Most of the poems are about one page, short intensely emotional. ‘What We Know of Blackbirds’, at six pages, is the longest poem and picks up the theme from the sentinel of loneliness and aging. It uses the language and images of horror and mystery, reminding one of Edgar Allan Poe’s ‘Raven’, but is a contemplative exploration of hallucinogenic solitude brought on by profound grief. The choice of blackbirds as the birds of focus gives it symbolic depth. It could easily have been cliché, bringing on Stephen King, Hitchcock’s Birds and the Beatles, but the subtle understanding of the subjective, of feelings and the edge of sleep terror takes it into the realm of beauty. Barry Napier’s collection of around forty poems is a substantial work worthy of wider notice. It courageously explores areas of life that are left untouched by many other art forms. Its style and emotional qualities take it into much deeper territory than the horror or dark lit that the promotional back pages suggest. To review a book like this is a little unfair since some of these poems are worthy of long consideration, of whole reviews by themselves. If there is a criticism it is that the collection is unlikely to pull non-poetry readers from the general public, people who don’t already love and appreciate poetry, but that’s not its aim. Another minor problem is that of consistent emotional tone, maybe this is about his voice and the publisher’s idea that it should all fit together thematically and stylistically but for me it makes it a bit flat. A poem in the last segment like ‘The Misogyny of Writing’ heads towards sensuality and love with humour but then ends with grave-robbing obsession. A beautiful rendition of an afternoon of lemonade and a daughter’s relationship with her mother ends with a wasp landing on a “glazed-over eye where it marched onward, unseen”. It is as if everyday life is not enough, not profound enough or worthy enough for poetry unless it points to death and grief. However, the fact is few ordinary people in everyday conversation chat comfortably talk about death and its emotional consequences, its relationship with love and loss. These are important parts of our human experiences and Barry Napier is unflinching yet compassionate and sensitive in his expression of the intimacy of these moments.